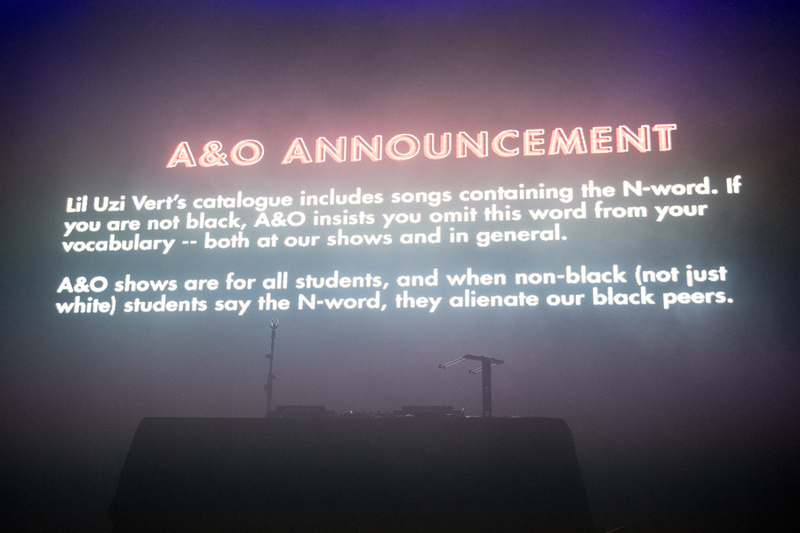 These were the first words I heard following A&O Blowout’s pre-show warning that cautioned non-black students against using the N-word during Lil Uzi Vert’s headlining set. A pack of pasty, hypermasculine hyenas reeking of bottom-shelf cologne and the haughty air of unchecked privilege stood among a sea of their peers — many of whom were cheering at the warning’s inclusion — and mocked the warning, filming videos of it for their Snapchat stories. After an already long night, most of which I spent arguing with friends over missing buses and showing up halfway through MØ’s set, I was prepared in the moment to let bygones be bygones and enjoy the rest of the show. That all changed when I overheard those boys, masquerading as men, spitting in the face of the spirit of inclusion that Louisa Wyatt, Troy Closson and many members of Northwestern’s black community requested of their white peers, myself included, specifically for this event. A beat or two passed as I absorbed what they’d said. Having already written about the bastardization of the term “snowflake” through the lens of social activism, I was livid that the expression was now being used by fellow NU students to criticize black students’ attempts to reclaim a word laden with actual historical malevolence. Not the most articulate of reactions, but the blow landed. The guilty party and his bird-faced cronies circled me like a flock of vultures, their collars popped more stiffly than Dracula’s. “Joke’s on you, I’m a first-generation student,” said the ringleader, his gold watch shining under the fluorescent light. “Congratulations. Are you a first-generation racist, too?” I replied. Their words grew threatening, trying to egg on a fight. My girlfriend, who’d also heard their angst over being politely asked not to use a racial slur, stepped in to give them an earful. She was met by an off-key chorus of three bottom-barrel glee club rejects screeching “TRIGGERED” in harmony. Two of them started filming, for some reason getting a kick out of being exposed for their gross racial insensitivity. At one point, it seemed like punches could have been thrown at any second. Instead, we stormed away, trying to find a place to cool our heads off. Disheartened, and certainly not in the right mood for a rap concert, we caught an Uber home before Lil Uzi Vert finished his first song. Our night may have been preserved had we chosen to willfully ignore those boys’ casual dismissiveness of the pre-show warning. But at what cost? The comfort they take for granted in a crowd comprised disproportionately of white students? The comfort that black students are eagerly trying to simulate, at least for a night? In other words: if you hear something, say something. It doesn’t matter if they’re your friend, your family member, your significant other, your professor — or a total stranger. So, to the boys promulgating your malignant indifference about black students to anyone who cares to hear it, and for any student with the inclination to agree with their words, I leave you with a couple of hopes. As a fellow white student, I hope you recognize the inequities implicit in our society against black people and all people of color, and understand that you are statistically safer, more likely to find employment opportunities and less likely to be incarcerated in your lifetime because you are white. Instead of taking advantage of this position, broadcast its implicit unfairness. And as a fellow first-generation student, I hope you take the experience of growing up uncertain about the stability of your future and use it to empathize with the struggle of others, to look at things from a perspective different from your own and to accommodate the comfort of others less privileged than yourself. Open your eyes, close your mouth and we can all listen to the music together.